We offer comfortable accommodation for couples, families and single travellers alike. One night free accommodation when booking an extended tour of four days or more with Tri State Safaris. True country hospitality in the heart of Broken Hill. The Argent Motel in Broken Hill offers comfortable accommodation for couples, families and single travellers alike with a range of affordable suites available. It is the ideal choice for those just passing through the historical outback city or for those wishing for a longer stay, taking their time to experience the wonders of the west. All our rooms are light and spacious, offering modern linen, private en-suites and complete with all the necessities to make your stay comfortable. All our rooms have reverse cycle air-conditioning, wireless internet and flat screen TV’s. Stay for one night or more, The Argent is at the hub of Broken Hill where you’ll find the heart of the great Australian Outback. Enjoy many eateries, art galleries, the views from the hills tops or simply sit back and enjoy the sunrise and sunsets. Take a short tour around town or take a trip to many National Parks, trip interstate and enjoy the flora and fauna along the way. Why not check out our other accommodation located across the far west of NSW. The group, Out of the Ordinary Outback owns a number of other properties in Wilcannia, White Cliffs, Ivanhoe and Broken Hill. Visiting the Out of the Ordinary Outback website for more information or call 1300688225 for all your accommodation and touring options. 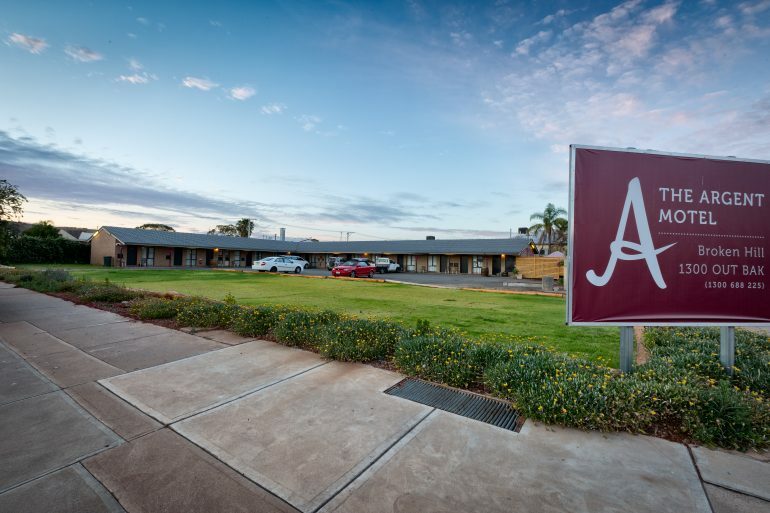 The Argent Broken Hill offers 13 motel rooms in a range of configurations, all at a great price from Queen Rooms to Twin and Family Suites, accommodating up to 4 guests. The motel has free on-site parking for guests and complimentary high-speed internet access. All of our rooms feature refrigerators, LCD TVs and tea and coffee making facilities. Rooms are made up daily. Queen bed sleeps 2 people. Also additional bedding available.